Mt. 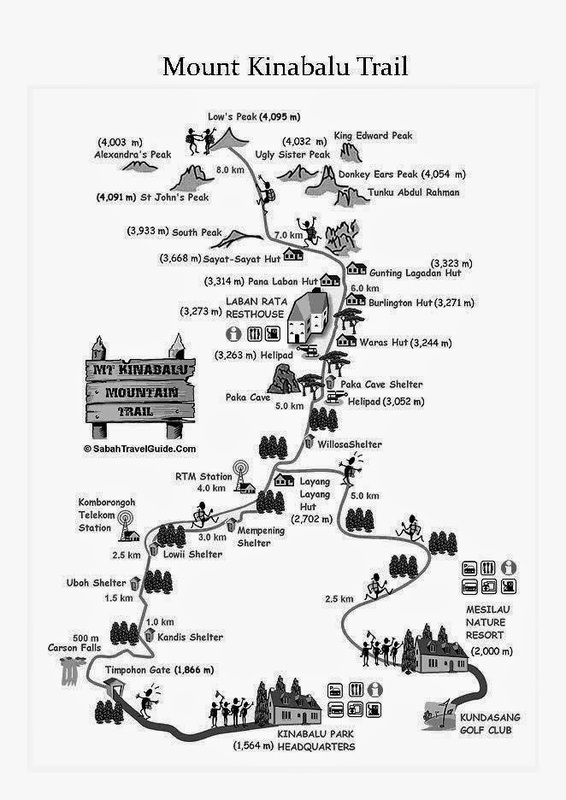 Kinabalu (4,095m) is 38.63% (1,141m) higher than Mt. Apo (2,954m), tallest mountain in the Philippines and 116.07% (4,753m) lower than Mt. Everest (8,848m), tallest mountain in the world. Indeed an incredibly rewarding! My 2nd time to visit Malaysia, 23rd solo backpacking trip, 1st time to perform major hike outside my homeland and of course, usual budget do-it-yourself itinerary from arrival to departure. I have been planning to visit Mt. Kinabalu since 2010. So far on my fun-hiking career, I conquered the 3rd highest peak of my homeland Philippines Mt. Pulag (2,922m) for twice in a row (2010 & 2011). Until now, I don't have plans yet on the highest peak which is Mt. Apo (2,954m). But since I cannot trekked Mt. Apo without a group and I visited Davao already for twice, it is better to maybe set aside for the mean time. Mt Kinabalu (4,095 meters above sea level) is the tallest mountain in South-East Asia and is situated in the Kinabalu National Park in the province of Sabah in Malaysian Borneo. Fortunately, Mt Kinabalu is one of the easiest peaks in the world to conquer. It takes just two days and climbers don't need any previous experience at mountain climbing. At sunrise, the views from the Mt Kinabalu's summit at Low's Peak are spectacular, making all the effort worthwhile. Most climbers take two days to ascend and descend Mt Kinabalu. The eight-kilometre climb generally starts from the the Timpohon Gate near park headquarters (1,800m), with an overnight stay at one of the guest houses at Laban Rata (3,273m), before pushing on to the summit early next morning. Mt Kinabalu's summit is usually reached in time to view the sunrise, before returning to Laban Rata for breakfast. Climbers then descend the mountain, generally reaching the park headquarters by mid-afternoon. Anyone with a reasonable level of fitness and the willpower to push through fatigue and discomfort can climb to the summit of Mt Kinabalu. It is achievable and incredibly rewarding. Climbing weather is best around the month of April while November and December brings rain. The temperature ranges from a comfortable 20-25°C at the main park to something approaching freezing near the top (depending on the weather). Bring appropriate warm clothing and windproof gear. If possible, climb during the full moon as it helps illuminate the white rope that marks out the climbing path. 2. It is required to bring some money to pay Sabah Park authorities for the Park’s entrance fee, mountain guide, climbing permit, insurance, certificate, porter fee (optional) and transfer to Timpohon Gate. This is separate from accommodation. 3. Make sure your legs are fit and ready for the journey up and down the mountain. Be a responsible traveler. Bring the necessary medication required if you are prone to altitude sickness. As it is only a two day, one night climb you are still advised to exercise regularly several months prior to the climb. 4. Remember to pack light to ease the weight on your shoulders. Ideally, the weight of your bag pack should be less than 10kg. Nothing especial, just like in other ordinary airports. Even though there was a recent territorial dispute between Malaysia and Philippines referring to Sabah islands, still, this did not affect my vacation escapade. Arriving very early in the morning around 0300H, I went to sleep first on the 2nd floor of the airport reception area. Wow! So nice. Hopefully I'll be able to climb Mt. Kinabalu too. We only went to the beach in KK last year.